Many of the poems in James Matthew Wilson’s The Hanging God are well-executed narratives. There are narratives, for instance, about an impoverished recluse in the contemporary Midwest, about W. H. Auden’s trip to China during the Sino-Japanese war, and about a nameless, exiled Croppy marching into Russia with Napoleon. There are narratives about failed relationships, dying family members, and dead-end jobs. Wilson—who is philosopher and theologian as well as poet—uses these narrative poems to explore the importance of story in our lives. When it comes to the saints, the power of their stories is rooted in their mysterious interiority. One of the most haunting poems in The Hanging God is “Some Will Remember You,” which is addressed to Edith Stein/St. Teresa Benedicta. Born to a German Jewish family, Stein was a brilliant philosopher who converted to Catholicism in 1922 and joined the Carmelites after reading St. Teresa of Avila’s autobiography: “The interior mountain beckoned you to climb, / The floors of the self-darkened room first creaked. / You wrote out what you saw and then sought stillness.” The Nazis later killed Stein at Auschwitz: “After the smoke, bones left forgotten, / Your jotted notes shut in a metal trunk, / As others bore reprisals and arrests, / Your thought lived in the study of a priest.” The second section of the poem begins: “In evil times and aftertimes, in times / When all the stubbled fields of action smolder, / Bowed heads can’t help but make their patient study / Of how the person worlds.” It goes on to depict a young Karol Wojtyła sitting in his wired room behind the Iron Curtain reading Stein’s words aloud “for all / The stashed and sensitive microphones to hear. / In those times, your words, carried on the quiet, / Fostered his own. Thought, act, and judging person, / The self in solitude revealing God, / Clicked like the murdered signal of your voice / Across a telegraph and moved his hand.” She becomes “A sainted sign / Named Edith Stein” whose mysterious love and fortitude nourished by the contemplative life contrasts sharply with the reductionist ideologies of the twentieth century. In his foreword to The Hanging God, Dana Gioia invites us to hear the echoes in Wilson’s poems. Gioia situates Wilson in the “high humanist Christian tradition” of English language poetry. He notes the influence of the modernists T. S. Eliot and W. H. Auden as well as of the recently deceased poets Richard Wilbur, Geoffrey Hill, and Helen Pinkerton Trimpi. (I would add the late Jewish humanist Anthony Hecht to this list.) While reading The Hanging God, though, I often thought of Robert Lowell, another of the “formidable ancestors” mentioned by Gioia. There were traces of Lowell in Wilson’s first full-length collection Some Permanent Things (which Wiseblood books recently released in a revised and expanded edition). These traces were especially evident in its opening poems, where rust belt locales serve as historical and spiritual palimpsests. “Acedia,” for instance, which is set at the Civil War Memorial in South Bend’s City Cemetery, evokes Lowell’s “For the Union Dead.” The Hanging God bears comparison to the early Lowell of Lord Weary’s Castle and The Mills of the Kavanaughs: intricately rhymed poems dense with historical, classical, and biblical allusion. Gioia notes “dark psychological isolation” and “spiritual anxiety” in many of the poems in The Hanging God, and these same descriptions apply to Lowell’s early verse. The comparison is perhaps most apt in Wilson’s powerful sequence of poems on the Stations of the Cross. Consider his poem for the penultimate Station: “Jesus Is Taken Down from the Cross.” The narrator leans an old pallet against a dumpster, but a wind blows it down and shatters it: “The hard wood clattered on the road / And split, exposed its secret load / Of bent and rusted nails, now spilt, / Scattered like seeds, like teeth and bones.” The poem seems far removed from the corresponding Station until the final lines: “One nail stared up from the cracked wood. / I plucked it out, just as they would / Who returned you to your mother’s lap.” We see a similar, startling connection in Lowell’s “The Holy Innocents.” It begins by describing oxen pulling a cart. They “drool and start / In wonder at the fenders of a car, / And blunder hugely up St. Peter’s hill.” In modernist fashion, the poem abruptly cuts to “King Herod shrieking vengeance,” and from there to how the war-embroiled world in 1945 “out-Herods Herod.” Circling back to the oxen, the poem ends: “If they die, / As Jesus, in the harness, who will mourn? / Lamb of the shepherds, Child, how still you lie.” The poems share an unflinching theological aesthetic. Wilson discerns the cross in the busted pallet; Lowell finds a hint of the Christ child in a startled ox. They read splinter and spit in terms of the Incarnation (and vice versa). The comparison should not be pushed too far. Here and elsewhere, Wilson largely eschews the sudden shifts, fragmentation, and highly wrought diction of the early Lowell. Furthermore, not all the poems in The Hanging God brood on “dark psychological isolation” or “spiritual anxiety.” There are several humorous poems. One is addressed to Wilson’s fellow poet and friend Ernest Hilbert, another to Hilbert’s wife on their wedding day. “Ecce Homo” is a playful satire of James Tate’s poetry. 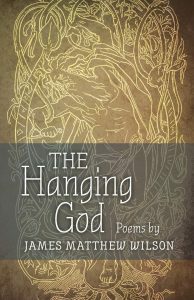 In both form and theme, The Hanging God is a wide-ranging collection by a versatile poet. Steven Knepper is an assistant professor in Virginia Military Institute’s Department of English, Rhetoric, and Humanistic Studies. His essays and reviews have appeared in journals such as Telos, Commonweal, and The Robert Frost Review, his poems in Pembroke Magazine, SLANT, and Presence: A Journal of Catholic Poetry.